A desktop nameplate. Customize it to show your name or text (Press "Open in Customizer" above or install OpenSCAD on your own computer). This version has 2 lines on top of each other. Big thanks go out to RLazure for the original design, which i remixed. I updated it to the new font library, to contain 2 lines and to make the nameplate grow and shrink according to your font size selections. If you don't have a dual extruder / MMU printer: Use the "full_nameplate" type. And use the "Pause @ZPos" or similar feature to change the filament during printing. 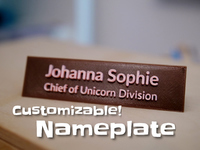 You can also create "A flat name tag", which is just a plate which you can stick on things directly. This was an idea/request from oxgon. If you have a dual extruder printer: Generate and use the 2 parts "dual_extrusion_base_part" and "dual_extrusion_base_part". 2 lines of text. Just leave one empty if you need only one. The font. Nice is e.g. : "Orbitron", "Bangers" or "Luckiest Guy". Each lines font size individually. 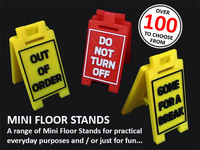 If you like it, also check out my configurable text based creations, multi-line label, sweeping nameplate, floor stand, gadget display stand, bunting banner, customizable text box III, pyramid text, 3D text, Customizable text box with lid and round text. Have also a look at my configurable pack of dogs and rabbits. Or see the customizable filament swatches to have an overview over your material. Or just have a look at all my customizable creations. Thanks go out to hetile that i can use the photos of the flat nameplates "Eve, Malik, etc"! You can print it without any support, in the direction as shown. This way the front will look smooth and clean.